The question was recently raised to me by an administrator during one of my CLT meetings. My school has opened its doors to education consultants from the private sector and administrators from central office. I’m not entirely sure why this is happening, but to be honest the reason doesn’t matter that much to me. As a teacher, I’m used to being told what I’m not doing well enough and what techniques I should employ in order to improve. Just like students. That said, these sorts of observations and interactions still make my stomach ache. The second the experts walk in, I feel like a kid. I wither under the scrutiny, stumbling over words, and making careless mistakes. It’s like I’m back in school and the teacher has just slapped a pop quiz down onto my desk. My training, my experience, my professional reading and writing all disappear. All that remains is the feeling of not being good enough. In Eleven, a magnificent short story written by Sandra Cisneros, the protagonist explains how misleading a birthday can be. When you turn eleven, she says, you’re still ten. And nine, and eight, and seven, etc. Just because I turned 35 last November doesn’t mean the difficulties of youth and inexperience are completely behind me. I still carry the emotional residue and muscle memory of three decades’ worth of triumphs, disasters, and everything in between. When it comes to school, I’m used to acquiescing to anyone higher than me on the chain of command. Returning to the administrator’s question, I had a choice in how I responded. I could have inquired about the question itself. For instance, why are so many children identified as gifted? Why do many of them come from white families with dual-earner incomes? Was that person aware of the larger history of the gifted and talented movement? Of white supremacy and colonialism and class anxiety and the various ways certain funds of knowledge are prioritized while others are denigrated? I could have engaged in a conversation about ability groupings and tracking and heterogeneity. Or about the research on the effects of race, class, gender, and family education level on student achievement. But I didn’t. I also could have used that time picking the expert’s brain to try and figure how to improve my teaching. 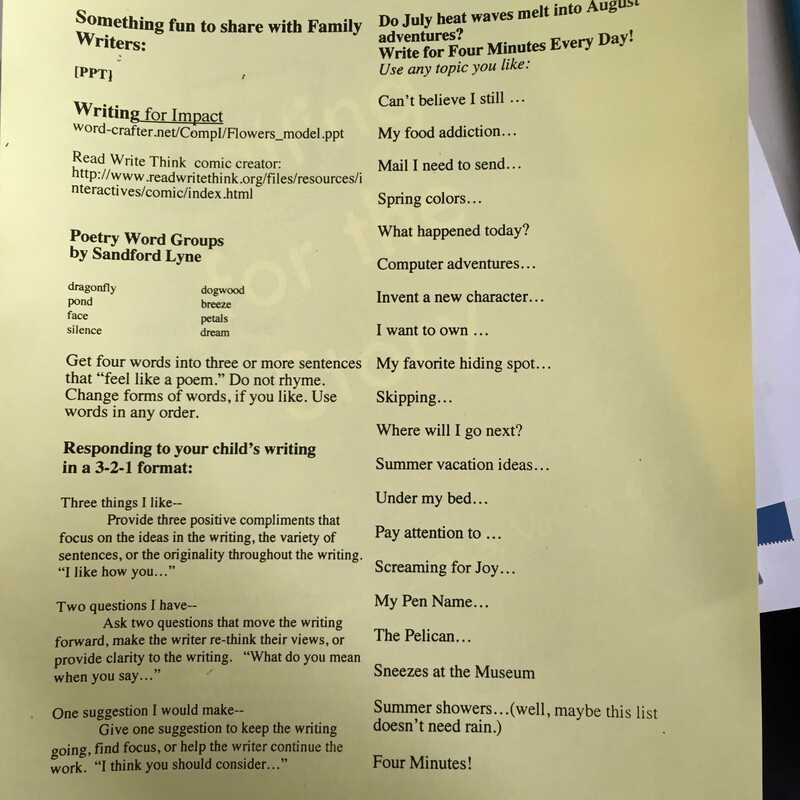 Maybe they had advice about finding engaging mentor texts without spending my weekends hunched over my computer. Or how I can use issues of social justice to inform my pedagogy. I could have mentioned my concerns about my district’s new remediation mandate. Or how the absence of grades and tests in my class makes family communication problematic. I didn’t say any of that, either. Instead, I provided a rote answer to a rote question. Was I differentiating? Yes. Leveled texts, scaffolded support, and differentiated assessments. Schools socialize. We learn which behaviors get us rewarded and which get us punished. We learn to recognize who is above us on the ladder and who is below us. For teachers and students, identities within a school are demarcated and negotiated along the familiar lines of seniority, content, and job title. As a teacher, I listen to mandates, close my door, and find a way to make it work. I don’t push back and I don’t cause a ruckus. And I don’t expect my administrators to, either. While it’d be nice to hear that the leaders of my school and district are pushing back against irresponsible and unfair mandates, I don’t count on it. It’s not part of the job description. Maybe they do and I simply don’t hear about it. For the most part, we remain in our boxes, using the tools granted to us by historical precedent and the prevailing discourse of our profession. Administrators wield data, push down initiatives, and support teachers in reaching various technocratic goals. In return, I use the standards, measure learning, and stay up to date on instructional strategies. This is not an anti-administration post. They’re doing what they’ve always done, and I’m doing the same. We are playing the roles bequeathed to us from the last 100 years of American public education. The central office administrators will be back with their questions, and I’ll be prepared with my answers. We’ll continue doing our jobs as if nothing happened at all. What follows is an overview of my day from March 2nd, 2016. The impetus for this post came from my constant amazement at just how busy I (and every other teacher I know) appear to be pretty much all the time. I’ve decided to break it down roughly by school period. I’ve removed any and all identifying markers to specific students and/or adults without sacrificing the spirit of what transpired on March 2, 2016. See part 1 here, part 2 here, and part 3 here. As soon as the final students vanish from of my room I tear through my first set of snacks. I eat the same things at the same times everyday, and 9:50 is trail mix and cereal bar time. I sit down at my desk and open up my notes from last week’s team meeting. Like pretty much every middle school, each grade is divided into teams. Each team has a leader. I signed up to be a team lead this year. This means I attend leadership meetings every other Tuesday afternoon as well as run the twice-a-week grade level meetings. Although my team has eight teachers on it, complicated class scheduling means only four can show up. The ‘major’ content areas are all present: math, social studies, English, and science. Teachers filter in at 10:00 and we get started. Today we have some logistics to talk about. First up is the end of the year trip. These sorts of trips are a middle school staple. Come mid June, adolescents across the county will be splashing around in wave pools, traveling to amusement parks, and visiting museums or aquariums. End of the year trips have a way of highlighting philosophical divides between teachers. Are such trips rewards? If so, does everyone get to go? If the answer to that question is ‘no,’ then what criteria do we use for deciding which kids get to go and which kids stay home? Academics? A certain GPA? Behavior? But we’re not that far along in the deliberations yet; we’re still in the planning and scheduling phase. This year, the testing schedule and the placement of religious holidays are complicating the process. Since my state now allows expedited retakes (when a child doesn’t pass the high-stakes exam but still scores above a certain threshold the state allows them to retake the exam. The idea is that children who fall into this narrow band are able to spend a few days cramming test strategies and thinking about ‘grit’ and perseverance before retaking the test), there are only a few school days that are free of tests, expedited retakes, rolling retakes (for those who miss a test due to absences) and 8th grade graduation. This stuff gets complicated quickly. I’ve realized that a) I don’t enjoy this sort of scheduling and b) I’m not particularly good at it, either. Whenever I tell someone this they immediately ask why I became a team leader. This is a puzzling question. To me it suggests that we think of leadership in primarily administrative terms: someone who deftly manages bureaucracy and knows how to ‘get things done.’ Leader as disseminator. Leader as conversational go-between. And maybe those are part of a general notion of leadership. But it’s not my definition of leadership, which is being able to create situations that allow others to come into their own. Building a stage for others to shine on. That’s also a definition, albeit a simplistic one, of what teaching means to me. Regardless of what we decide to do, we have to raise money. To offset the cost of the annual trip, we’ve decided to sell popcorn as a fundraiser. Representatives from student government will setup tables and try to entice weary parents and strangely hyper children to buy the popcorn. One of the teachers on my team agrees to run this. After discussing the end of the year trip, I ask if anyone has anything they want to talk about. No one makes a sound. Everyone in that room is thinking about at least twenty pressing things they have to get done before they leave for the day. And I get it. We all have parents to email, administrative forms to complete, and copies to make. In fact, sitting next to my laptop are three recommendation forms for students who are applying to a leadership program. They’re right on top of a set of half-completed seating charts which in turn rest on miscellaneous copies of lesson materials and random notes to myself. This is in addition to the meaningful work of planning lessons and reflecting on instruction. The mood in our team meetings fluctuates just as widely as in my classes. Today is a mixed bag. Some of us have our laptops open and seem to be absentmindedly tapping away at the keyboard. Others stare at their phone. Although I asked everyone to please keep their devices closed a couple of months back, I don’t enforce it. I spend my day pushing children to read more, write more, and treat each other with kindness in a system that seems set up solely to provide negative feedback. This requires near unfathomable levels of energy. I need some time when I’m not actively monitoring someone, and the teachers in the room need time when they’re not reacting to something. Everyone on my team is great teacher, and great teaching is exhausting. We deserve this moment to just sit. Besides, I’m sure I’ve done it. Roughly forty minutes later the bell signaling the end of third period chimes. We normally end each meeting by mentioning something that’s made us happy. I typically have to initiate it. Most of the time I don’t mind; it’s fun to hear about everyone’s individual moments of joy. Teachers come alive when we get to discuss what we do in our classrooms. But this morning was difficult and I just don’t have it in me. No one else mentions it so I call the meeting to a close. Guest Post! 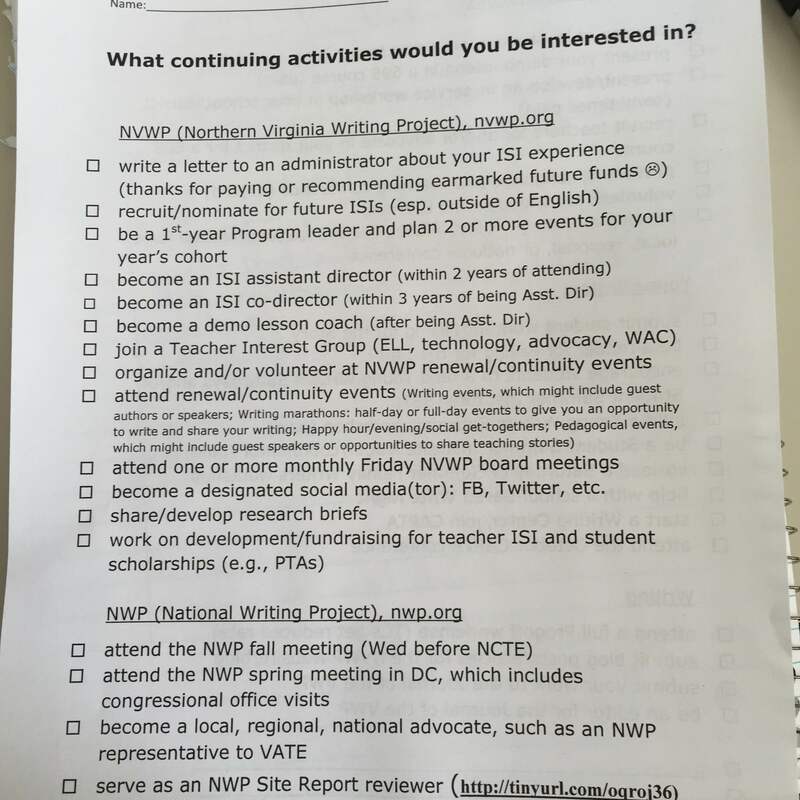 What can a newly minted NVWP Teacher Consultant do? – A Bevy of Resources and Information! Here is a comprehensive list of important dates, links, and activities for the freshly minted Teacher Consultant. Ill post the link to an attractive PDF; a more functional (albeit way less aesthetically pleasing) version below. 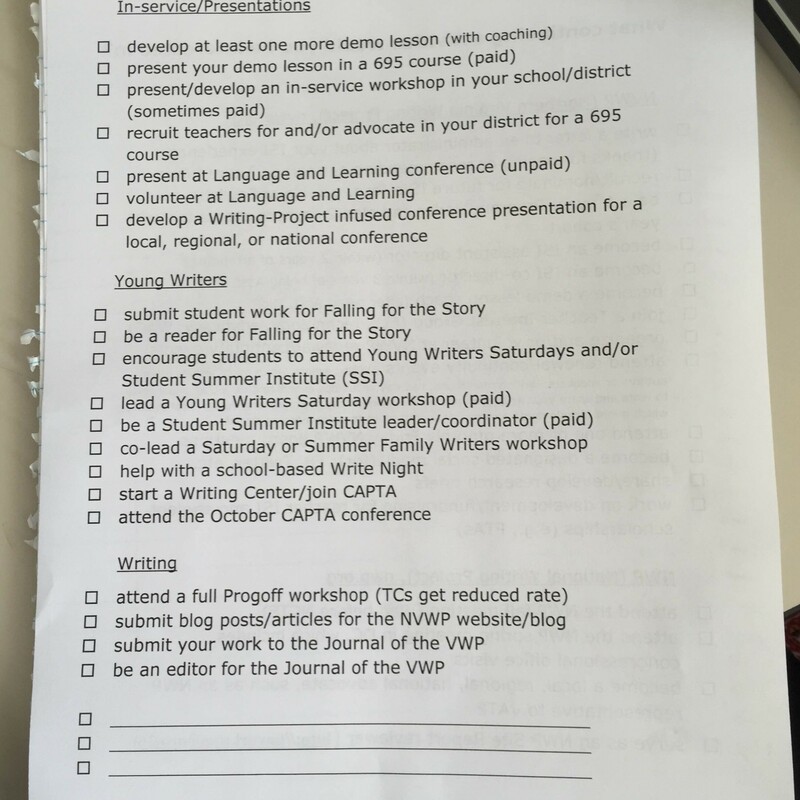 I completed the NVWP ISI 2015-so, now what? · Tons of autonomy and independence! · Attend the NWP Spring Meeting · Washington, D.C.
Our final presentation is from assistant director Amber Jensen. We’ve been focusing a lot on teaching practices in the classroom. 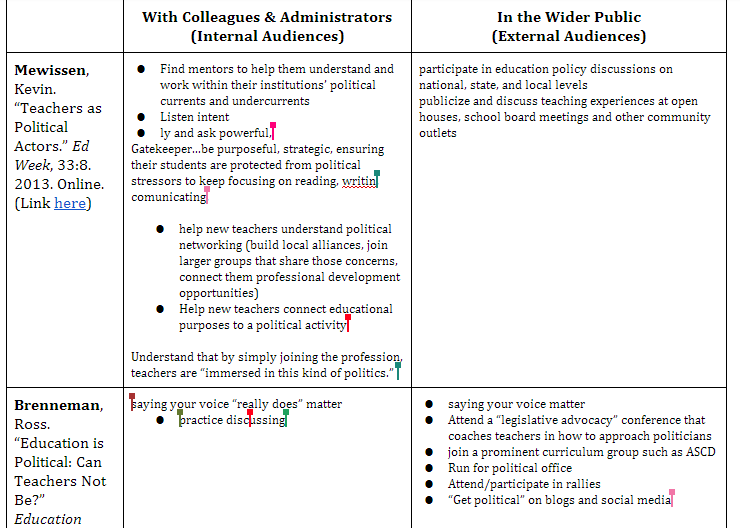 Now we’re going to zoom out and examine what a teacher’s voice looks like in the public sphere. Amber sets up a value line going Class – PLC/Dept – School – District – State – Public. We all write a sentence on an orange sticky-note explaining how and where we feel our voice is valued. We group up by our place, share out our experiences with our group, then come back to share with the group. Jigsaw! How do we feel our voices are heard? Classroom folk: Our voices are shut down trying to do things beyond the four walls of our class. PLC/Dept folk: We wanted to have a larger voice but there was no room to be heard outside of the department. Too many voices in leadership going in too many directions. School folk: Many of us are on committees which helped us gain influence outside the class. District folk: We’re able to speak at conferences and have our programs pushed through. I would add here that this statement applies equally across other disciplines. Perhaps what Peter is getting at here is that English teachers (along with math teachers) are inarguably the teachers most affected by the wholesale takeover of education by media/private companies/politicians. Paying ‘mere attention’: Read blogs, follow blogs, be active on social media, even if you’re not ready to put stuff out there! Amber gives us two articles from Education Week (subscribe to EW, btw). As we read, we annotate for the following question: How can teachers engage as leaders to influence decision making and policies with their colleagues and administrators and with the greater public? We talk out about what we could relate to from the articles: You can’t be neutral on a moving train. No matter what we’re doing, teachers are political. Even shutting out doors and doing what we’re told is a political action, one that politicians and education CEOs like, btw. That we shouldn’t be angry and complaining. Purge it out and then move forward. Amber discusses that there’s too much finger pointing in education policy. That we get stuck in hamster wheels of complaints. So don’t simply complain. This is cumulative. A way to have all student voices heard. There’s no way for the dominant voice to control. Think equity in discussion. Next, we read through what’s in the list. Then we make comments about what we see on the doc. For instance, “I wonder…”, or “This is…” The room goes silent as everyone comments on each other’s points. This is an excellent way to foster any sort of conversation in the classroom. Question 1: Is becoming politically active worthy of my time? (yes!) Amber talks to us about how becoming more involved has helped her stay vitally interested in her profession. -Avoid teacher burnout. Wider engagement can help us stay fresh and connected. -Find your friends. Ignore the haters (you probably won’t change their mind). Invest in those with open minds. Question 2: What’s holding you back? This is topic near and dear to my heart. I also don’t know if I’m able to answer this question without getting into my own personal situation. I struggle to find other teachers who share my views. That’s really the short and quick of it. We share out about what might deter or intimidate us from engaging? Answers include: what’s so unique about my views? Who am I to share my opinion? Many of us feel powerless. Not worthy of being heard. The amount of energy you exert vs. what actually ends up happening. OK. So what are our options? What are some examples of things Amber and Jen have done? There’s so many opportunities! Like, really. Tons. Email department heads. Get in touch with anyone who might know something. Look on your county’s website.